When you arrange to send your parcel to Hungary with DPD Local Online, you can be certain that you’re booking a parcel delivery service that you can trust. Located firmly in the middle of Europe, Hungary is a very popular destination for cheap parcel delivery from the UK. At DPD Local Online, we’ve got an extensive European parcel courier network, and can help you arrange posting to Hungary quickly, and at a price that suits your budget. Arranging to send a parcel to Hungary can be stressful, especially as the Hungarian language is said to be one of the most difficult to learn in the world. 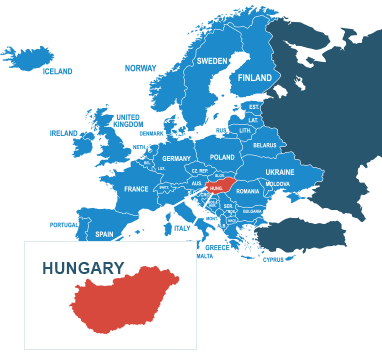 Sending your parcel to Hungary with DPD Local Online will ensure that your parcel delivery goes as smoothly as possible, and with high service levels guaranteed. Our express and economy courier delivery services will enable you to get your parcel to Hungary at the best price, whether you’re sending a parcel to beautiful Budapest, Debrecen or somewhere more remote. When you choose to send your parcel to Hungary with DPD Local Online, you can be certain you’re putting your parcel in safe hands. Hungary is actually a member of the European Union, which means that there’s no need to worry about customs duties when you send a package there from the UK. Postage to Hungary starts from as little as £20.00 only when you book through DPDLocal-Online. Our strong relationships with our couriers means that we’re able to negotiate the lowest prices possible for our customers, so you get cheap parcels every time you shop with us. Hungary has a couple of addressing rules that marks it out as a little different from other countries in the EU. To make sure you’re addressing your parcel correctly when posting to Hungary, check out this useful Hungarian addressing guide that the Universal Postal Union have put together. Print materials that could be judged to incite hatred to a particular demographic. If you’re unsure whether your item is lawful in Hungary or not, you can contact the Hungarian Post Office for more information. Check our prohibited items list too for any items that are not permitted in UK post.